With: The Mamas & the Pappas, Canned Heat, Scott McKenzie, Simon & Garfunkel, Hugh Masekela, Jeffersen Airplane, Big Brother & the Holding Company, Janis Joplin, Eric Burdon & the Animals, The Who, Country Joe & the Fish, Otis Redding, Jimi Hendrix & Ravi Shanker. There’s an instantly recognisable quality to Monterey Pop, a sense of having seen this film, these scenes, these events already, whether you’ve seen the film itself before or not. 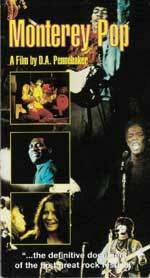 In essence, it’s a concert film, covering a three-day pop festival held in Monterey in 1967, and hosted by The Mamas and the Papas. If you’ve ever seen a news report about The Big Day Out, or any of the other big outdoors multi-band concert events, in fact most pop footage of any kind, you’ll recognise the style and the format of Monterey Pop. The songs themselves form the centrepiece of the film; band after band of ’60s pop icons follow one after the other, shot with hand-held cameras, often in close-up to capture the rapturous intensity of live performance. Every now and then, the camera cuts away to the crowd’s reactions, en-masse and individually (my favourite is a close up of Mama Cass from The Mamas and the Papas, her jaw dropping in amazement as she sits in the crowd watching Janis Joplin tearing her heart out singing ‘Ball and Chain’). Framing all of this are brief sequences interspersed amongst the performances sketching out the life of the festival itself; the bands arriving at the airport, the stadium being set up, the crowd dribbling in, setting up camp, eating, sleeping, kissing, doing all the things that crowds do. If the format seems familiar, that’s because it is. Along with his earlier documentary of Bob Dylan’s 1965 tour of England, Don’t Look Back (1967), director D.A. Pennebaker more or less mapped out the whole pop documentary genre for all the film makers who followed him (watch 1988’s Rattle and Hum, or 1991’s In Bed with Madonna after seeing the two Pennebaker films, and you’ll see what I mean). Pennebaker has also directed music documentaries on Jerry Lee Lewis, David Bowie, Jimi Hendrix, and Depeche Mode. Music has been one of two consistent themes throughout Pennebaker’s career; the other is politics. In fact, Pennebaker is probably still most strongly associated with his part in the film that is credited with bringing the ‘direct cinema’ documentary movement to prominence in America: Drew Associates’ Primary (1960), which follows John F. Kennedy and Hubert Humphrey’s battle for the Wisconsin Presidential primary (Pennebaker took up a very similar theme in The War Room (1993), which follows the Clinton team on the election trail throughout the 1992 U.S. presidential campaign). Many of the same people who worked on Primary also worked on Monterey Pop, including most of the big names of the direct cinema movement – Richard Leacock and Albert Maylses amongst them. If there’s a connection between the music and the politics it’s in the idea of performance – that both musicians and politicians are playing to and for an audience (Clinton literalised this connection with his saxophone playing). Of course, there’s a certain tension between the idea of performance and that of documentary. There’s an implicit assumption that documentary is in some sense meant to be ‘about’ the presentation of reality, or of the truth (problematic notions at the best of times). Performance, on the other hand, is explicitly a kind of lie – one ‘performs’ a role, acts it out, presents it for the consumption and approval of its intended audience, rather than ‘expressing’ some inner truth. A film like Primary plays on this tension, showing us both aspects of the public performance of the politician on the campaign trail, and giving us access to the ‘reality’ behind the performance, behind the scenes (such as the eponymous ‘war room’ of the team coordinating Clinton’s election efforts). Monterey Pop, on the other hand, offers us almost nothing of the backstage ‘reality’ of the performers on stage. What we see instead is pure performance – the individuals reduced (or is that elevated?) to iconic status. Even the crowd, and the festival itself, take on a kind of iconic status, marking out that peculiar mix of enthusiasm, creative energy and naiveté that characterises the idea of ‘the sixties’ (the Woodstock festival, as the iconic moment of the period, is in some ways a scaled up version of the Monterey event, which preceded Woodstock by two years). Part of the problem with watching this kind of iconic performance, of the bands and of the event itself as the essence of one particular idea of the sixties, is that this set of icons just seems too familiar to be interesting, have been reworked and replayed too many times to take seriously. When Hendrix humps his amplifier (and yes, it looks as silly as it sounds), or makes love to his guitar and then sets it on fire and smashes it to pieces, we’ve seen it imitated and recycled so many times by so many bands that the originality of the moment is lost. This is part of the irony of watching a document of decades old popular music – nothing ages as quickly as pop culture. However, one thing does remain constant; watching the closing sequence of the film, with Ravi Shankar performing ‘Raga Bhimpalasi’, it’s clear that whether they’re played on a guitar or a sitar, then as now, crowds get really excited by lots of notes being played as fast as they possibly can.